In this “incentivized” era, the need to develop and implement systems that meet physician needs and enhance workflow is greater than ever. With IT icons such as Bill Gates and Steve Jobs knocking on AARP’s door, computers are no longer considered gizmos of the upstart generation. As a matter of fact, familiarity and comfort with computers is now pretty standard for people of all ages currently in the workforce, including most doctors. And for those in the Mark Zuckerberg generation, computers are not just a tool to use at work but a way of life. Why, then, is the healthcare industry still struggling to get physicians to ditch paper charts in favor of EHRs? An examination of the evolution of computer use in the healthcare industry illustrates how physician adoption—while once thought to be a generational matter of familiarity—is a far more complicated issue that is demanding organizations go beyond simply ensuring physicians are comfortable with computers to implement technologies that will meet physician needs and enhance workflow. When the personal computer was introduced several decades ago, the technology was met with mixed reactions among the general public. As always, there were the dedicated few and for them the personal computer was almost magical, a gateway to strange new lands and seemingly unlimited potential. For the rest it was an abstraction, just another blip along the path from vacuum tubes to transistors, from black-and-white television to color sets. Physicians as a subset of the general population responded in much the same fashion. Of course, a small group of technology zealots were vocal supporters of computerization, as they imagined just how powerful the technology could eventually become in the direct patient care arena. Some other physicians—especially medical students, interns, and residents—weren’t ready to totally embrace computers but were willing to give the technology a shot. This group began a neutral if not friendly relationship with computers in 1965 with the advent of MEDLINE, which quickly became the gold standard for locating and printing medical data ranging from research to medical therapeutics. For most physicians, however, the presence of computers in hospitals made sense only in the business office and the laboratory, as those processes took place behind closed doors, far from patients and patient care, and didn’t need to be understood as long as the outcome was useful. The notion that computers could somehow have a place at the nursing station or have a beneficial impact on making rounds and treating patients required a real stretch of the imagination. IT continued to evolve over the ensuing decades. As software applications became more sophisticated, the use of computers for viewing lab and transcription results became more commonplace. At about the same time, the “user interface” became more user friendly with the introduction of Windows-based software and point-and-click functionality. Although improvements in the interface promoted increased utilization and efficiency among physicians, the “anticomputer” forces found an earthly manifestation of the electronic boogeyman: the keyboard. With this as their talisman, they were solidly entrenched. • The keyboard is cumbersome and difficult to use. • The time required to learn how to use the technology is disruptive and, therefore, has a negative impact on patient care and physician income. • Lab and radiology already put their results in the chart and if you need them in a hurry, you can always get someone to print them. • Orders are much easier and faster to write, and phone orders are even faster. • Electronic things always break, and what if the power goes out? In the daily work of caring for patients in many community hospitals across the country, computers and clinical software programs seemed like more trouble and expense than they were worth. While the anticomputer folks were comforting themselves with retorts such as “I’m a doctor, not a #@*%#!!! secretary” and “I’ll take my practice to ABC hospital before I will ever be forced to find my lab results on one of those,” computers were becoming an integral part of American culture. The video game industry was busily creating a legion of computer-savvy superusers. The initial wave began with Pac-Man and became a full-fledged tsunami with the appearance of the so-called Game Boy generation. Sure enough, the Game Boy kids were accepted into medical schools and took their considerable computer skills and savvy with them. In academic medical centers, healthcare computing found fertile ground. In these environments, the notion that computers with the right software systems could enhance healthcare delivery while improving efficiency and outcomes was well received. The rough edges presented at the time by less than ideal workflow and suboptimal processes were smoothed a great deal by the presence of numerous interns and residents to perform data entry. Development flourished, often in collaboration with computer hardware and software vendors eager for the opportunity to expand both research and market share. Meanwhile, whole new vistas for medical computing were appearing. Computerized clinical documentation was unleashed on the nursing profession. Terms such as “CIO,” “CMIO,” and “EHR” were being bandied about, and the anticomputer gang was beginning to contemplate retreat. The advantages of HIT became a widely discussed topic. In 1999, a groundbreaking report by the Institute of Medicine titled “To Err is Human” shed a stark light on the huge problem of medication transcription errors and adverse drug events that were taking thousands of lives in our hospitals each year. Many credit the report as being the primary catalyst for the accelerated development of computerized provider order entry (CPOE) and clinical decision support. Improvements in computer hardware also spurred increased HIT adoption. For instance, devices have continued to become smaller, lighter, and more powerful. In addition, clinical software applications have become more intuitive with better workflow and more robust functionality. At the same time, consumer-savvy patients as well as government and regulatory agencies have pressured physicians to computerize. Patients powered by Google and enabled by WebMD now arrive for their appointments well informed about the malady in question and ready to discuss a variety of details and treatment options. The government and its regulatory/oversight agencies, such as the Office of the National Coordinator for Health Information Technology and the Centers for Medicare & Medicaid Services, are creating a new playing field (CPOE and meaningful use) while promulgating rules such as pay for performance (core measures, readmission rates, and hospital-acquired problems). The end result: Physicians expecting success and prosperity can no longer afford a resistant and dismissive attitude regarding the demands and requirements of an increasingly automated environment. To their credit, most physicians have taken the proverbial bull by the horns and confronted the issue of computers, software, and regulations by conducting a thorough examination of the challenges at hand, arriving at an assessment, and creating a plan. Today’s physicians are more inclined to view the hospital/clinic/office computer as the tool it was intended to be, the engine behind an electronic chart that can be used in more powerful ways than the paper chart. • There’s easy and quick access to transcribed documents and images both at bedside and from remote locations. • Physicians have the ability to instantaneously compare a lab value from the current admission to the previous two admissions without calling medical records. • Results for stat and now orders are available the moment they are completed without reporting delays or the need to locate the chart. • There’s the ability to share information with multiple providers in multiple locations. • Whether it is accessed from a patient room or from a mobile device, the EHR is always in its most current state, eliminating the need for clinicians to go back and forth to the nursing station. • A vast repository of patient data collected daily and stored in databases allows healthcare organizations to identify best practices and turn information into “actionable” knowledge. Although the benefits of HIT are becoming more widely recognized, the use of EHRs and physician adoption still trails behind expectations. According to a 2009 study published in The New England Journal of Medicine, only 1.5% of hospitals have comprehensive EMRs, 7.6% have basic EMRs with clinician documentation, and 10.9% have basic EMRs without clinician documentation (physician’s and nurse’s notes remain on paper). However, while CPOE implementation and online physician progress notes have lagged behind expectations (17% and 12%, respectively), more than 75% of hospitals surveyed have adopted electronic laboratory and radiographic reporting systems. Physician adoption also seems to be a sticking point for hospitals attempting to move their EHR initiatives forward. According to the HIMSS Analytics EMR Adoption Model (an eight -point scale that measures a hospital’s progress toward the full utilization of electronic records), fewer than 20% of hospitals have experienced the CPOE and clinical decision-support requirements to achieve stage 4 status. The remainder have electronic records installed but are still working toward getting physician buy-in. 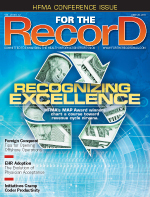 Financial incentives emanating from the ARRA are expected to accelerate EHR adoption rates. CPOE, once an academic elective, is now a requirement, making moot the argument of whether an organization intends to participate in the whole affair. The fact that there are very few if any physicians who still fear computerization makes widespread adoption seem like a given. As a result, the EHR conversation has shifted to the point that it’s more like, “Now that you have insisted that I use this product, you have to make it work for me.” The majority of physicians no longer fear the keyboard. Instead, their concerns rest with being yoked to a system that will negatively impact productivity, their ability to deliver quality care, and their bottom line. When discussing HIT, the conversation among today’s physicians is most often about access, performance, portability, efficiency, and output. What was once a resistant approach is now a more informed, involved, and proactive approach. With continued attention to system enhancements, improved workflow, and more efficient processes, the industry should continue to experience a steady growth of physician acceptance and adoption. To elicit physician adoption and realize benefits from HIT, healthcare organizations need to go beyond installing software and pay close attention to issues such as system integration, interface capabilities, data storage and retrieval, order communication processes, and physician workflow optimization. Providers need to implement EHRs that offer the best features and functionality. Some physicians will question how long it takes to accomplish certain tasks and point out their disdain for the need to make numerous click-throughs. Others might compare the system to other solutions they have used and demand similar features and functionality. When developing CPOE order sets, organizational leaders should make physician workflow a top priority. Instead of taking an ivory tower development approach and coming up with “all-inclusive” diagnosis-driven sets—a long and arduous process—it’s better to develop generalized admission order sets and supplement them with a variety of a la carte and individual orders. To start, CPOE development teams can take repetition out of the development process by utilizing a robust common admission order set that can be deployed for a variety of order types, including general medical/surgical, ICU/critical care, and trauma. ADC VANDALISM, a mnemonic used in medical schools across the country, can serve as the foundation of the admission order set. With this in place, the orders break down as follows: Admission, Diagnosis, Condition, Vital signs, Activity, Nursing orders, Diet, Allergies, Lab and rad, IV fluids, Studies, and Medications (scheduled). Compact specific order sets for common conditions such as acute myocardial infarction, diabetes, and chronic obstructive pulmonary disorder can be added. In this model, physicians can use the admission set and select separate but prebuilt subset(s) as appropriate (a la carte). If necessary, they can add a few individual orders for daily additions and/or therapeutic adjustments/corrections. In the final analysis, providers can get exactly what’s needed: A quickly developed CPOE system that enables physicians to place their orders in the same way they think. With that capability, when using the system day in and day out, doctors don’t waste time searching the system for highly structured and specific order sets—and they will actually tap into the system more frequently. While healthcare leaders no longer need to convince physicians of the need for computerization, they do need to pour significant time and energy into workflow and clinical processes with respect to the way information systems are designed and implemented. This focus on enhancements will encourage physician adoption and pave the way for improved care. — Chip Quammen, PA-C, is president and chief medical officer at Quammen Health Care Consultants, an Orlando, Fla.-based HIT consulting company.